Because the fight for fair compensation begins as soon as a car crash occurs, call Orange County car accident lawyers as soon as possible. They will make sure you get both the medical treatment you need and the financial compensation you deserve. Sometimes, these cases settle quickly and on favorable terms. But more often, there are complex legal and factual issues which the insurance company tries to exploit, and that’s why you need an experienced legal counsel. At Russell & Lazarus, we believe that an attorney is more like a partner, so we put together this guide to help you through the events that occur immediately after a car crash. Many times, the tortfeasor’s (negligent driver’s) insurance company wants to talk to the victim to “get a statement.” In reality, the phone operator wants to trick the victim into making damaging statements. Before you speak to anyone, talk to an Orange County car accident lawyer. Emergency responders are not there to gather evidence for victim/plaintiffs. Initially, that’s your job. Get the names and contact information of eyewitnesses, take pictures of damage with your phone, and try to locate any nearby red-light or surveillance cameras. It’s normally a good idea to share this information with any passengers, in case you get in a wreck and are too hurt to do these things yourself. Many car crash injuries, such as whiplash and head injuries, are difficult to detect. So, even if you do not feel any searing pain, go to a doctor straightaway. 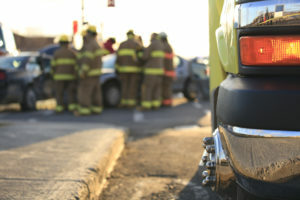 Orange County car accident lawyers can refer victims to vehicle injury specialists, usually for no charge. Once you have partnered with Orange County car accident lawyers, call your own insurance company and report the incident, but if the operator asks for any specifics, refer him/her to your attorney. Driver error causes over 90% of vehicle collisions. Sometimes, that error is a momentary lapse that occurs at exactly the wrong time. But much more commonly, the driver error involves negligence, which is a lack of ordinary care. Failing to follow the rules of the road (speeding, making an illegal turn, running a red light, etc. ), behavioral driving errors (e.g. driving while intoxicated or drowsy), and failing to adjust to adverse conditions (such as driving too fast on a wet road) are all examples of negligence. Defective products, such as bad tires, cause most of the other car wrecks in California. Orange County car accident lawyers can hold companies strictly liable in these situations, which means that the company must pay damages regardless of their negligence or lack thereof. Poorly designed or maintained roadways also cause some vehicle collisions, and the government entity responsible for the road is responsible for damages. These matters are very complicated, so it’s very important to have an experienced lawyer on your side. Ordinary Negligence: If the tortfeasor violated a legal duty, and that violation caused the victim’s injuries, the tortfeasor is liable for damages. Negligence Per Se: If the tortfeasor violated a safety law, and that violation caused the victim’s injuries, the tortfeasor is liable for damages. In both these situations, victim/plaintiffs must prove liability by a preponderance of the evidence (more likely than not). Also in other these situations, victims can receive compensation for their medical bills and other economic losses, along with their pain and suffering and other noneconomic losses. Most personal injury cases settle out of court. An experienced Orange County car accident lawyer can accurately ascertain the value of an individual case, to ensure that you don’t settle for less than fair compensation. At Russell & Lazarus APC, your claim for damages is just as important to us as it is to you. Our Orange County car accident lawyers can help you through each stage of the process.